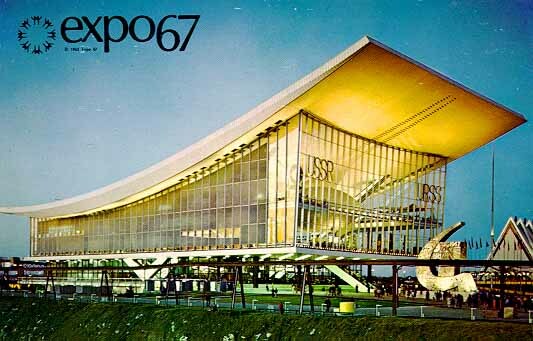 The Soviet Union's pavilion, one of the largest at Expo, was modern in architectural form, almost Western in appearance. Soviet architects, by using great walls of glass and aluminum topped by a ski-jump roof, departed from their traditional boring monolithic architectural style. The escalator that lead up into the pavilion prepared the visitor for the surprise of the wide-angled V beams that supported its upswept roof, and carried him into a symmetrically organized display area dominated by a huge bust of Lenin. 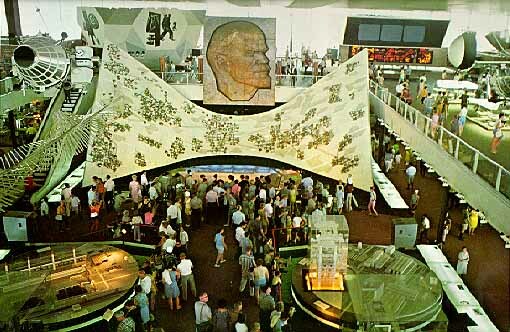 The USSR pavilion, one of the largest at Expo, had a light airy look with its huge expanse of glass and aluminum walls topped by a ski-jump roof. 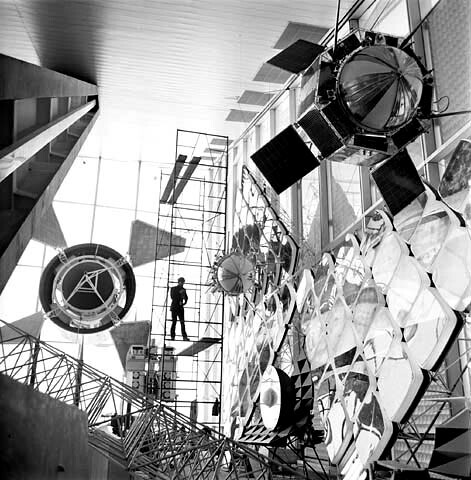 The challenge met by the pavilion's designers, was both to present a broad image of the USSR, and at the same time dazzle the visitor with their technological achievements. The story of the exhibits was of three elements; Earth, Sea and Sky and of what the Soviet people had done to draw benefits from those elements "all in the name of man, for the good of man". The section on the main floor, welcomed the visitor as he stepped off the escalator that led up from the esplanade in front of the pavilion. Above were two mezzanines, the topmost appropriately devoted to its fascinating space exhibits. The floor below contained the Sea Exhibit, the theater and the restaurants. The displays in the Earth section, stretching away from the top of the escalator, made a huge statement of the Soviet Union's abilities. Models, machines, samples of raw materials, photographs, films, illuminated maps and sketches were used to tell the Soviet's achievements and future plans of its oil and coal industries, secondary and consumer goods industries, housing and town planning, agriculture, chemistry, metallurgy, thermal and nuclear power, mechanical engineering, optics, instrument making and quantum electronics. Working models like that of the Kransnoyarsk hydroelectric power station were created with precision and were highly educational. 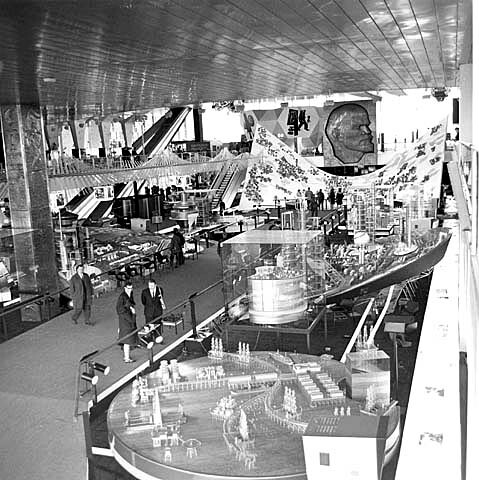 The USSR pavilion's main floor was devoted to their technological progress on land, while exhibits on the mezzanine above were of their successful space program. A huge bust of Lenin set the tone. Example of the USSR's industrial might. In the Sea exhibits on the bottom floor were also displays of Soviet progress. There was a model of a desalinization plant for fresh water and a model of the atomic icebreaker "Lenin". There was also a fish pool where sturgeon, "the mothers of caviar" pursued their journeys to lay eggs. High under the roof, a broad gallery was devoted to the conquest of space. 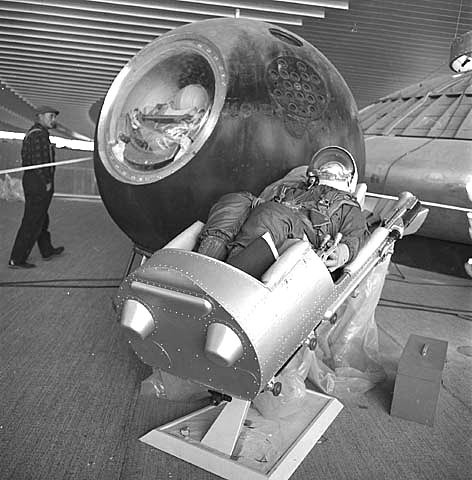 A fire-blackened replica of Yuri Gararin's space capsule competed for attention with mock-ups of the surface of the moon and Venus. Overhead hung several dozen Sputnik models, each designed for a specific purpose. Nearby, in a section on aviation, were models of futuristic aircraft like the SST. Examples of the USSR space program. Cosmos Hall, a spherical 60 seat theater, was popular but required reservations. Passengers were strapped into seats for a simulated liftoff into orbit and a journey to Mars. The seats vibrated as projectors showed views from the theater capsule. The large theater downstairs presented cultural shows of its fifteen diverse provinces. Each week a different province performed and each showed its unique historic and cultural attributes. 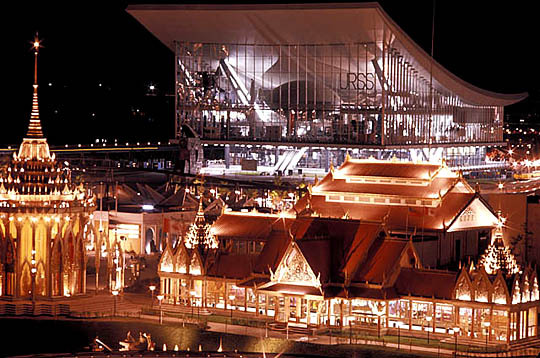 The pavilion's art and culture section showed the country's recent past. There was a canvas that showed street fighting during the Revolution and a rugged statue of a soldier defending Stalingrad. On a more gentle note, a craftsman sat deftly carving a troika and drawings of kindergarten children were displayed. Also downstairs was the popular 1,100 seat Moskva restaurant. It served a varied fare of Siberian pelmeni, Ukrainian borscht, Caucasian shashlyk and other delicacies from the USSR's fifteen provinces. USSR pavilion in the distance at night.